The Spanish vihuela and the Italian version, the viola da mano, are problematic for the modern luthier because there is very little information with which to work – possibly three surviving vihuelas (all of which are probably atypical to some degree) and iconographic sources. There are however seven large printed books of music published in Spain between 1536 and 1576, containing a huge amount of high quality music, so there is every reason to attempt modern reconstructions of these instruments. I started with the engraving (based on a lost painting by Francesco Francia) by Marcantonio Raimondi (c.1510) (right). It shows the philosopher Giovanni Filoteo Achillini (1466-1538) playing a viola da mano. His instrument is clearly quite large, with a string length probably nearer to 70cm than 60cm. Most modern reconstructions of these instruments have been much smaller, with string lengths in the region of 50-60cm. This may be because modern players prefer small instruments and it is true that some of the solo repertoire occasionally requires difficult left-hand techniques which are not suited to large instruments. We know, however, from written sources (and from Enríquez de Valderrábano’s duets for two vihuelas) that several different sizes were in use. I settled on a string length of 69cm, to be tuned in e’ at modern pitch, having had good experiences with six-course lutes of this size and pitch. 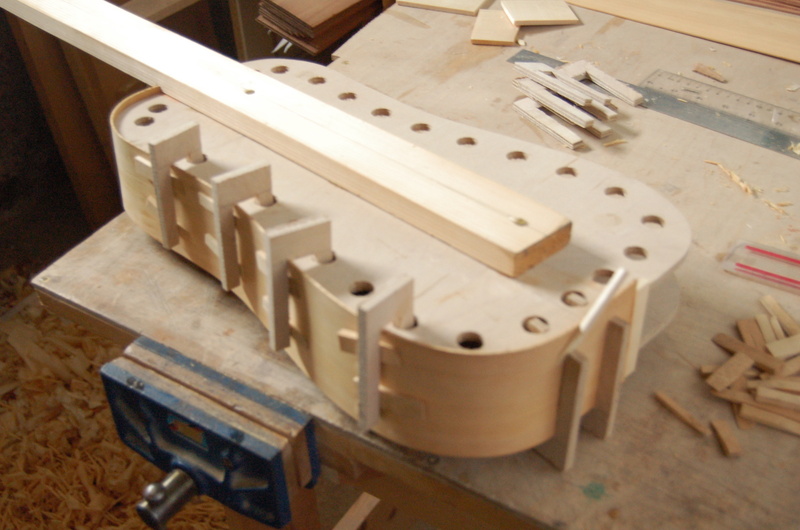 I subsequently decided to reduce this to 68cm to get the tenth fret slightly closer to the body/neck join, which also had the effect of making it possible to tune in f’ or e’. Achillini’s viola seems to have nine pegs, suggesting a five-course instrument, but attempts to count the strings suggest seven courses! Written sources confirm that both five and seven-course vihuelas existed, but all the surviving music for is for six courses, so I opted for a six-course version. The music also requires ten tied frets, which is confirmed by the iconography generally and means the join where the neck meets the body must be about where the twelfth fret would be – halfway along the string. 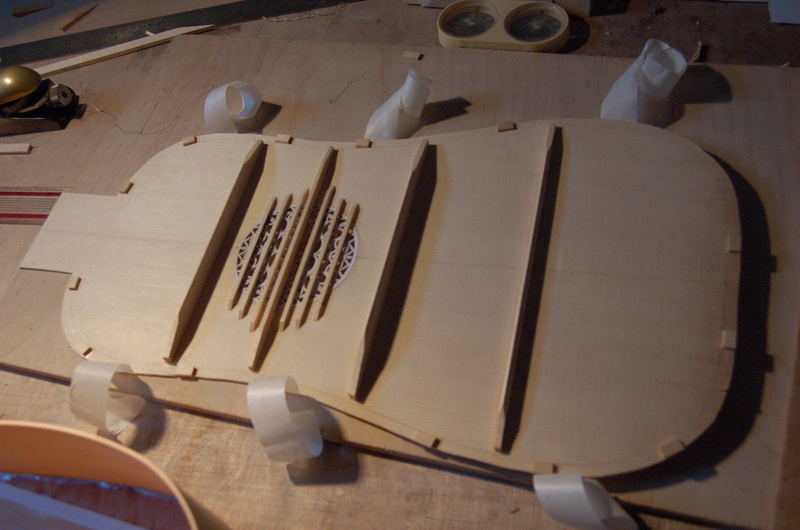 This is because a fret cannot be tied close to join due to the “heel” of the neck. Unfortunately in the engraving, while there do indeed seem to be ten frets on the neck, the body of the viola is longer than it should be according to this proportion. I assume that the end of the bridge is just visible below Achillini’s arm, but it is hard to tell whether this is really the end of the bridge or not. 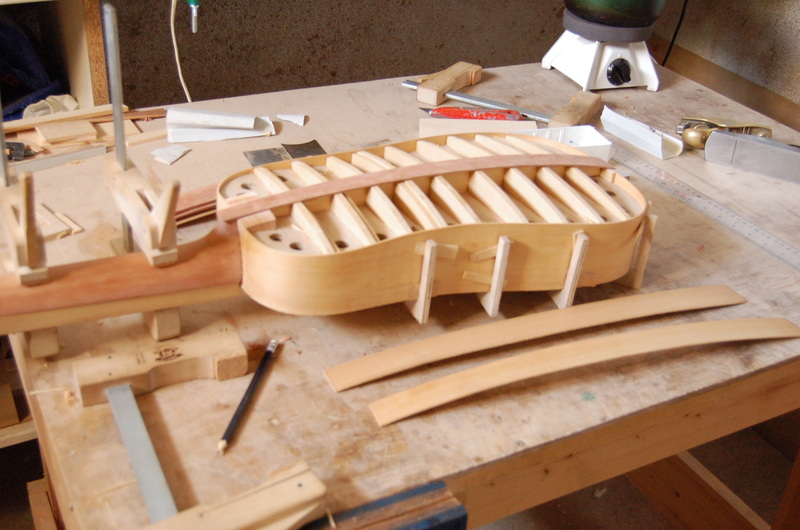 In any case I decided to shorten the body in relation to the neck in order to get a neck long enough for ten tied frets. We cannot see the back of the viola in the engraving, but luckily Achillini is resting his foot on the case and this gives us some useful information. It seems the body is quite shallow, and the shape of the case suggests the back is slightly vaulted rather than flat. Having never made a guitar-shaped instrument before, I had some learning and improvising to do. I made a mould consisting of two flat plywood plates separated by a block to space them the correct distance apart, with a “toast rack” of pieces of jelutong for the vaulted back. The plywood plates had holes all around the edge so the sides could be clamped in place, and cutouts at each end for the blocks – at the neck end a large block of willow and at the other end a small spruce liner. The blocks were tack-glued in place and shaped to fit the contour of the back. 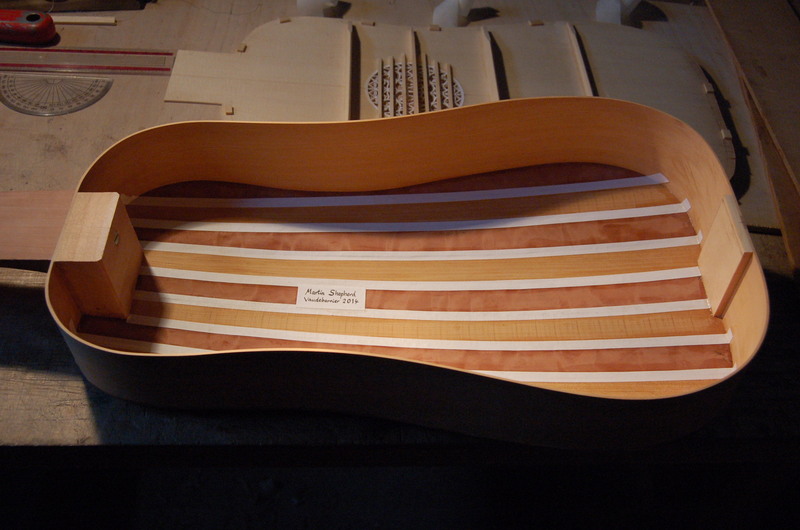 The cypress sides (about 1.8mm thick) were then bent and clamped to the mould, and the back built up like a lute back, starting in the middle and fitting and gluing the ribs either side. For the ribs I used cypress and rippled pear, again about 1.8 mm thick. In Fig. 2 you can see the stick which I screwed to the mould to position the neck. I decided to attach the neck to the complete body with a separate neckblock rather than slot the ribs into the side of the neck as is often done on guitars. 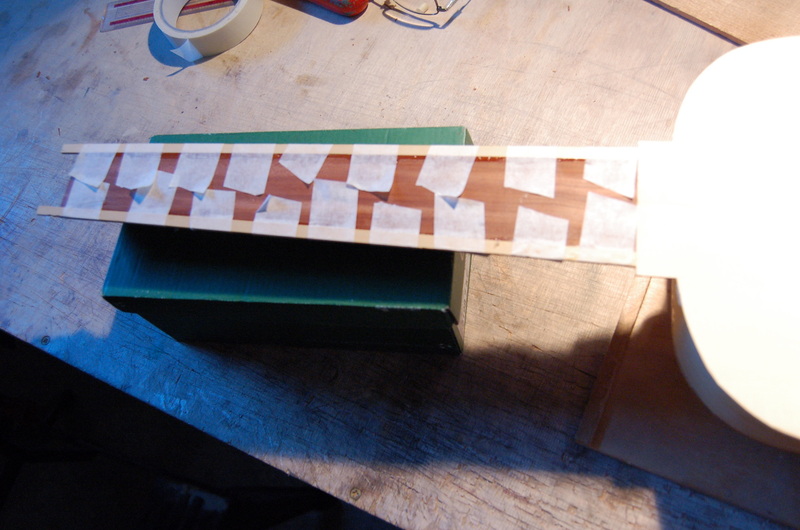 I lined the rib joins with paper, as in a lute (Fig. 3). Barring was very much open to question – later guitars seemed to have just two bars either side of the rose, but having done this I decided the soundboard was too flexible (from side to side) in front of the bridge and put another bar there. I chose to use a lute rose carved in the soundboard rather than an inserted rose made from parchment and pearwood – both types seem to have been used on the old instruments. The outline could then be marked on the front with the instrument still on the mould – but how was I going to make sure the shape stayed correct when I removed the mould? I stuck little pieces of spruce around the edges so the sides would keep to their original position when I glued the front on (Fig. 4). I used a similar technique for gluing the fingerboard. I had decided to use plum for the centre of the fingerboard with boxwood edges (to provide a harder edge so the frets didn’t dig in too much). Having prepared the centre I glued small pieces of spruce either side of it so that when it was glued on it stayed in the correct position. Then these small pieces were removed and the edges glued on (Fig. 5). The pegbox was carved from solid pear and fitted into a rebate in the same way as a lute pegbox (see above right). The finished instrument was clear varnished to preserve the beautiful and contrasting colours of the old cypress and the rippled pear.